Why do we call this man ‘Alexander the Great’? I can understand the western world, the English or the Americans calling him ‘Alexander the Great’. After all, Ancient Greece is seen as the ‘cradle of Western Civilization’, the birthplace of democracy, rationalism, philosophy and the arts. Western powers, such as the Americans see themselves as heirs to this legacy, a legacy that stretches back through time in an unbroken line to the city-states of Ancient Greece. This is why, the Greek classics are considered to be the foundation of every modern liberal arts program across American Universities today. Even the American Government seems to use words such as ‘freedom’ and ‘civilization’ in much the same way as the Greek writers and politicians did millennia ago when talking about the Persian Empire. Given all this, I can understand why he is called ‘the Great’ by western historians and I can understand why he is considered a national hero by the Greeks. But I cannot understand, why we, in India, refer to him as Alexander the Great and not as Alexander the Barbarian. 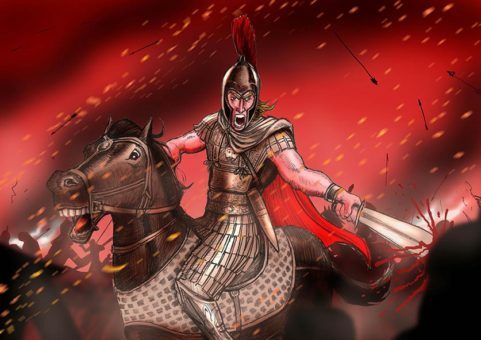 As an Indian, when I look at Alexander, I see an aggressor who attacked India with no previous history of rivalry or any just cause, I see a bloodthirsty tyrant who repeatedly massacred populations who had surrendered to him against oaths, and a barbarian who fought against all established codes of warfare then extant in India (this is described by Megasthenes in his book Indika and is also there in the notes section of my book). When I look at facts, I also strongly suspect that Alexander, might not, in fact, have won the Battle of the Hydaspes (purely a conjecture, which I have described in the notes section of my book). Why do we, then, call him Alexander the Great in Indian history books? Chengiz Khan conquered far more territory than Alexander and the empire he built helped trade, commerce and the exchange of ideas between the East and the West for a number of centuries. The Mongolians call him ‘The father of the Mongols’. And yet, in the western consciousness, there is an image of him being little more than a bloodthirsty conqueror, a barbarian. Another conqueror Attila is called ‘the scourge of God’ while the propaganda against Napoleon used to be that he was the anti-christ. Undoubtedly, this was what it seemed like to the nations who bore the brunt of these conquerors aggressions. So what should we and our history books see him as? I vote for barbarian. We call him great because he also built karezes, the underground irrigation channels that still work in places like Syria and Afghanistan. Besides, he was Aristotle’s pupil, well versed in philosophy. Incidentally, Greece was not part of any ‘Western’ world, because arguably, a “western’ world did not exist those days. What existed was trade and commerce between Greece, Persia, Indian subcontinent and China. So a great exchange of ideas on face-to-face democracy and other concepts marked those times. I don’t think that still qualifies for evergreen title of “the great”.